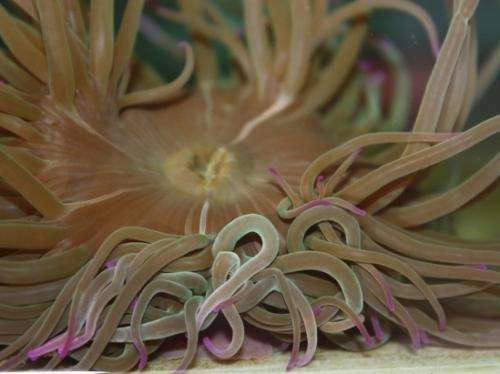 'Snakelocks anemone', bred in captivity by the University of Granada spin-off concern, iMare Natural S.L. 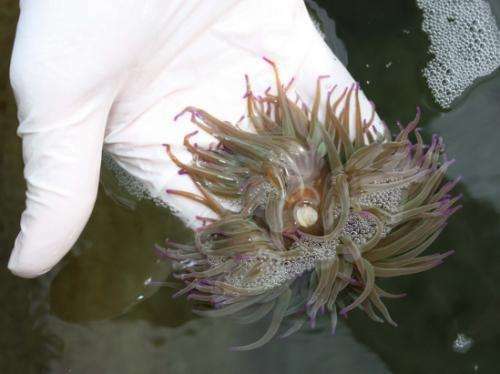 Researchers from Granada have managed to breed for the first time in captivity a marine animal known as the snakelocks anemone, (Anemonia sulcata), and have also begun breeding a species of sea cucumber (Sticophus regalis), although this process is still in its initial stages. Both species have great culinary potential and possess excellent nutritional properties. As well as these two species of marine invertebrates, the scientists have cultivated the edible saltmarsh plant Salicornia, also known as marsh samphire or sea asparagus. The harvesting of anemones for use in gourmet restaurants and eateries is creating a decline in their numbers, and due to the high prices they reach on the market, poaching and over-exploitation are "considerably damaging the ecological niche in coastal and inter-tidal areas". iMare Natural S.L., a University of Granada 'spin-off' concern, is developing methods of raising these species and incorporating these techniques within the aquaculture sector. It is a practice based on making the most of the surplus organic products that result from the cultivation of these products. As Pedro A. Alvarez, one of the researchers and co-founders of the firm, explains, "Until now, these marine products were solely obtained by trawling, a practice which affects the ecosystem considerably". With regards to the snakelocks anemone, one of the species that has been cultivated for the first time in Granada, Pedro Alvarez states that "it has hardly any calories and contains essential components for our health, due to its high content in proteins, cholesterol and purines, along with its low fat content". Furthermore, Salicornia contains 30-40% of proteins, calcium, magnesium and sodium, as well as a high proportion of essential fatty acids (Omega-6), which, in the case of its seeds, can be as high as 75%. This high content in linoleic acid helps to considerably reduce blood cholesterol levels. The plant absorbs salt water and is increasingly used as a garnish for fish or seafood dishes, or is cooked along with other vegetables. In addition, Salicornia is rich in oils and can be used for producing bio-fuel. Finally, the sea cucumber is a highly-prized product in the cuisine of Catalonia, the Balearics and Valencia, where its price can be as high as 150 euros a kilo. In the past, it was eaten by poor fishing families, but nowadays it is served in the best restaurants". Could the humble sea cucumber save our seas?